What do blue eyes and skies have in common, and why does the sky color change in intensity? 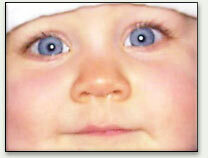 Blue eyes are common in infants in whom dark pigments, such as melanin, have not yet formed. Only blue is seen against the dark interior of the eye. Just as the cerulean blue of a baby’s eyes fades over time, so does the blue sky as it stretches over the horizon - but two different scattering effects are responsible for the changes. 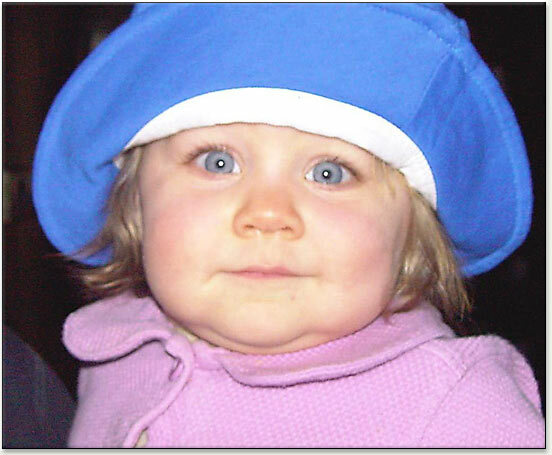 The same scattering phenomenon that causes blue sky also accounts for the blue color of eyes, particularly in the intense blue seen in many infants. Other eye colors are formed by melanin. For instance, a little yellow melanin produces a green iris color; if melanin dominates, brown and black colors appear. People with albinism have an absence of melanin, so the blue scattering adds to the red of the eye’s underlying blood vessels to produce pink irises; this also accounts for the pink skin of some light-skinned people. Careful observation of the sky reveals that its color varies in its intensity depending on the angle of observation. The blue color gets lighter close to the horizon. 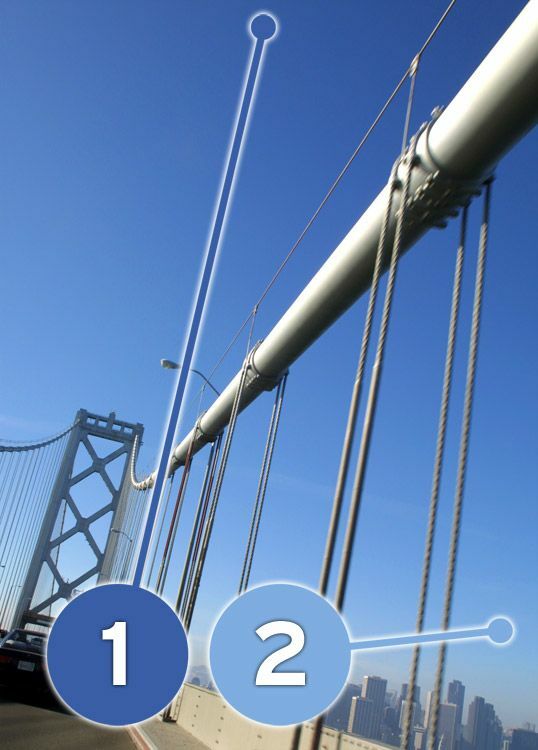 In this clear sky from a San Francisco bridge, #1 is the blue color higher in the sky, and #2 is closer to the horizon. Why does the sky get lighter closer to the horizon and seem bluer in the mountains? The variations of blue across the sky cannot be explained using the framework of the Rayleigh theory, which describes scattering by particles much smaller than the wavelength of the incident light. 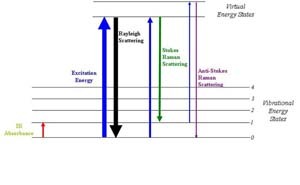 The Rayleigh theory holds for the scattering of visible light (with wavelengths ranging from roughly 400 to 750 nm) by atmospheric gas molecules with dimensions in the order of 1 nm (1 nanometer equals one billionth of a meter), which are considerably smaller than visible light wavelengths. Blue wavelengths are scattered downwards and the sky appears blue. However, the molecules of gases are not the only particles contained in the atmosphere. Aerosols, such as particles of dust, smoke, droplets of liquids, minuscule crystals, bacteria, and pollens float in the lower atmosphere. The typical dimensions of such particles can lie anywhere between several hundred and more than ten thousand nanometers. When these aerosols are comparable to, or even larger than, the wavelength of the incident light, a different scattering model applies. German physicist Gustaf Adolf Mie (1868-1957) investigated this kind of scattering, and established that the intensity of light scattered by bigger particles is practically independent of its wavelength. In Mie scattering, white light remains white after having been scattered by particles such as aerosols. The concentration of the aerosols is highest close to the ground, and so the blue color of the sky is lightest close to the horizon where large aerosols scatter white light. The aerosols are washed out by rain, causing a deepening of the blue color of the sky following rainfall. The blue of the sky appears deeper in the mountains because lower percentages of large aerosols are found at higher altitudes. White light is scattered by large particles, as occurs in fog and clouds. The variations in intensity of our sky are caused by the interplay of blue-light scattering by gas molecules, and white-light scattering by water drops and dust. Raman spectroscopy, which employs the inelastic Raman scattering model, is a useful investigative tool. Microscopic, molecular, and Raman spectroscopic approaches were used to reveal the cause of the microbial agent of rosy discoloration on these ancient paintings from Crypt of the Original Sin, in Matera, Italy. If the size of the scattering particles is smaller than the wavelength of light, then the Rayleigh theory applies. If the size of the scattering particles approaches the wavelength of light or exceeds it, then the complex Mie scattering theory applies and permits scattering of colors other than blue; white is scattered at the largest sizes. This theory also applies to scattering particles that are electrically conductive. Rayleigh and Mie scattering are elastic scattering processes, as there is no change in the wavelength of the incident light. 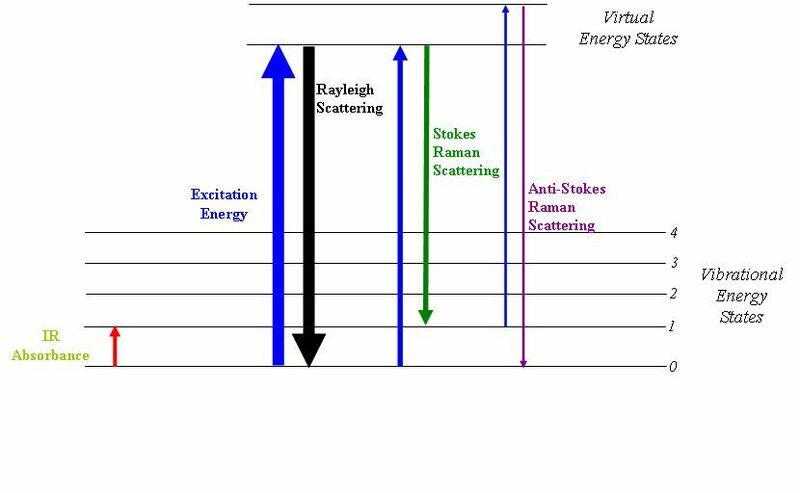 Forms of inelastic scattering, in which there is a shift in the wavelength, include Raman scattering and Brillouin scattering; both of these have important implications for laser operation and in fiber optics.